Classic pound cake gets a chocolate boost in this rich dessert that's finished with a decorative drizzle of melted chocolate. 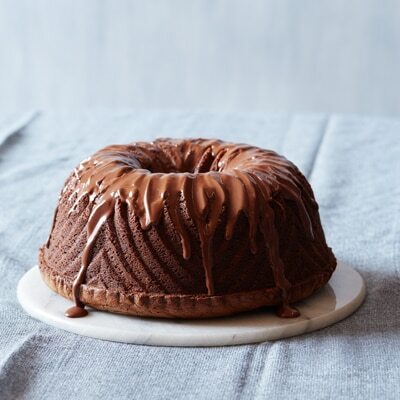 PREHEAT oven to 350º F. Grease 12-cup Bundt pan. MICROWAVE 1 1/2 cups morsels in medium, uncovered, microwave-safe bowl on HIGH (100%) power for 1 minute; STIR. The morsels may retain some of their original shape. If necessary, microwave at additional 10- to 15-second intervals, stirring just until morsels are melted. Cool to room temperature. COMBINE flour, baking powder and salt in medium bowl. Beat sugar, butter and vanilla extract in large mixer bowl until creamy. Add eggs, one at a time, beating well after each addition. Beat in melted chocolate. Gradually beat in flour mixture alternately with milk. Spoon into prepared Bundt pan. BAKE for 55 to 65 minutes or until wooden pick inserted in cake comes out clean. Cool in pan for 30 minutes. Invert cake onto wire rack to cool completely. MICROWAVE remaining morsels in heavy-duty plastic bag on HIGH (100%) power for 45 seconds; knead bag. Microwave at additional 10- to 15-second intervals, kneading until smooth. Cut a small hole in corner of bag; squeeze to drizzle over cake.